This year is coming to an end and new year is coming. After all the shopping and spending money on gifts and clothes, setting our financial goals for next year should be the most important step towards our financial future . It is really important to start thinking about your financial goals so that you don’t have to feel guilty about the extravaganza of holidays. Here we are discussing about short term financial goals. 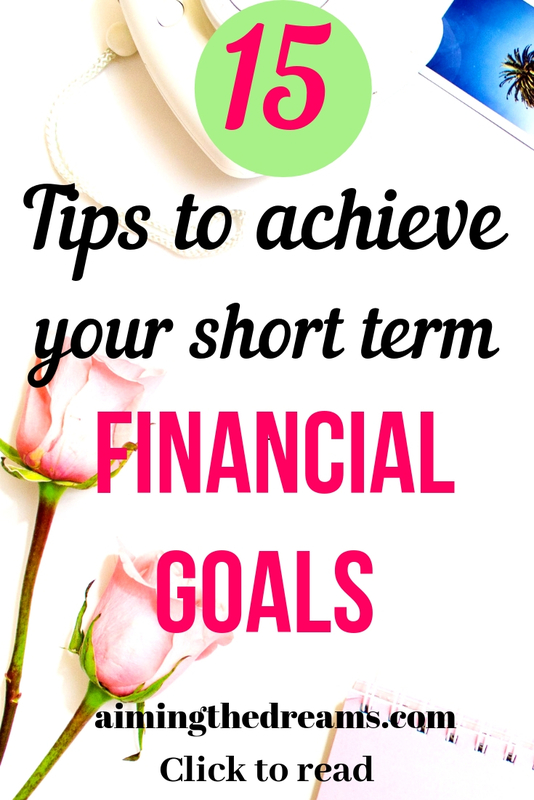 Short term goals can be classified further depending on your needs of daily purchases. If you want to purchase any decorative piece or special toys for your kids or you want to have a party at home, keep those goals under short term goals. Save money for all the purchases and make it a habit to write goals for every purchase. A clear vision for your goals is so important in life. Same applies for financial goals also. When you know clearly what you want from your goals, it becomes easy to work on them. Write down your financial goals and why you want to accomplish them. For example you want to save 1000 dollars in 4 months. Write down your why for the goal. Your why always give you required inspiration to take action. When you have a clear why, how becomes lot easy. Tracking your spending gives you insights into how much you are spending and where you can cut to save extra dollars. These saved dollars can easily go into fulfilling your financial goals. Try to squeeze money from every spending. Make it a habit of writing down how much extra are you saving and put that money right away in your saving account. If you will not do that, your saved money will be spent somewhere else. Your financial freedom depends a lot on your budget. Creating a budget helps you in allocating money according to your needs and you can squeeze some more money to save. Budgets are not required for only bigger economies but for smaller household economies also. Budgeting helps you in having enough money for all of your expenses and enough for saving and investing. Write down the small purchases you will want to make in coming quarter. Write down all the money in front of every purchase and set a time . Then save that much amount and buy whatever you want to. you want to save $1000 for a piece of furniture it in 4 months It comes out to be $250 on monthly basis and around 63 $ roughly for a week. Start putting 63 dollars a week aside for your said purchase. You will be very happy when you have to buy the furniture as you don’t have to pay from your salary. If you haven’t allocated any money for your emergency fund, this is the time to start building your emergency fund. If you need to set an emergency fund of 9,000 dollars in 3 years. For this year , your goal should be roughly 3000 dollars. It comes out to be 250 dollars for a month. Now it is your choice to set aside money either monthly, biweekly or weekly. Start with whatever is practical for you to save. You can increase your emergency fund allocation gradually. And stack some money which you will need for your expenses of 3 months in emergency. Credit card debt is not good for financial health. It is important to pay your credit cards. Start with small payments. Make a plan in how much time you want to pay it. If you have a habit of paying your credit card on time, you don’t need to panic. If you have some money on it, just make a plan and try to pay it in small denominations. Clear your credit card debt as soon as you can. If you are not into investing, start it now. Money will not grow unless you start investing. Compounded interest is really magical. It will earn you the money for which you will not work. Your dollars will grow without any extra work. Start with small amount of money and with less risky investments. This one is really my favourite. Start some Side hustle to earn extra money. Internet has opened so many doors for earning extra money with some side hustle. There is something for everybody. If you are crafty, DIY person, have some skills, have house to rent for travellers, I mean there are endless possibilities to earn money. Have clear focus on your needs and wants. Wants are way bigger than needs. Spend less on your wants and focus on needs. This way you will spend less and start putting that money into investing. If you now how much you normally spend on monthly basis, you will be able to reduce your spending. Reduction in spending is always an increase in savings. You will have more money without earning any extra money. Write down how much reduction in utility bills you want. Write down your previous bill and write down the amount you want to reduce from your utility bill. It will give you insights into what you want to change in your habits of using energy. If you are saving some set amount of money, try to increase that amount even if it is few dollars. Whatever you saved yesterday will give you inspiration to save more on your money. Make a plan to pay off debt gradually because there is no feeling other than being debt free. Start with the smallest debt , pay it and you don’t have to pay the instalments for the same. This saved money could go to pay bigger debt. 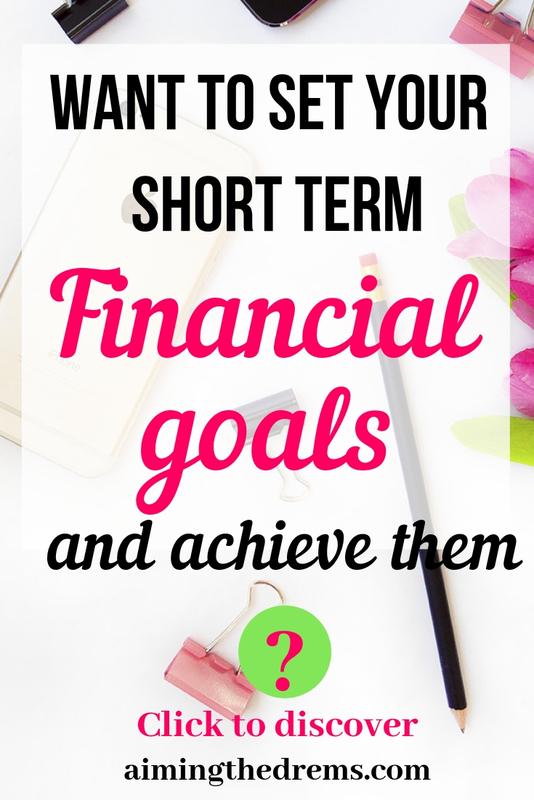 Short term goals are set quarterly, monthly and then on weekly basis. Always try to be on track with your goals. You can make some adjustments on the way but keep clear focus on your goals. Keeping a clear focus is important to accomplish any goal. Keep your distractions away. Say if you have to keep $ 50 for something aside and you liked a piece of dress and you really want to buy it, don’t give up on your impulse. Just take a deep breathe and think do you really need it or you just want to buy for the sake of it. Keep all the distractions on the bay and keep focus on your financial goals. Always keep a time limit on your goals even if they are financial goals. Without the time limit, your goals are merely day dreaming. Even small events can distract you and you will not be able to accomplish your goals. Goals not having clear timeline are easy to forget and you will not feel obliged to keep those goals. It is so important to work on daily basis towards your goals. Remember your goals daily. Working daily instead of once in a while will keep you on rack and you don’t have to worry about reaching your goals on time. Small steps taken daily takes the overwhelm of financial goals off from your mind. You feel at peace with your inner self because money is a very big cause of stress in today’s world. 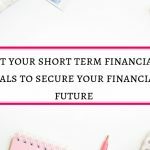 These are all my thoughts on setting and achieving short term financial goals. 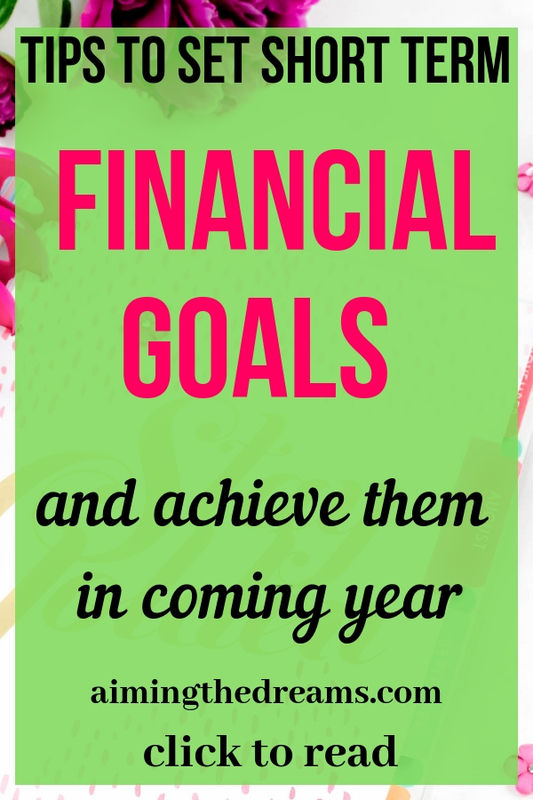 Hope these will help you in setting your financial goals during next year.In am really exited to set new goals for coming year. Stay with me and grow your savings. Please share this post if you like the tips. I will be really grateful from my heart. I love these tips! I can have the best intentions with a financial goal, but if I don’t write down and make a plan it won’t happen. Hey Nicole, I agree that if we don’t write down our goals, they get buried under our day to day work. Mere thinking does nothing. Thanks for stopping by and reading. A lot of people I know could really benefit from reading this. This is very informative. Thanks! Thanks Renee for your kind words. Love this! Definitely worth thinking about! Thanks for stopping by and reading..
All my spending is spur of the moment. Have been trying to be more mindful. A budget feels so scary and also feels like you cannot have fun. Yes Latha it happens like this. But tracking your spending and budgeting will help you in saving as well as have fun. You’re right. These tips, if implemented properly, can go a long way in ensuring financial stability. Thanks Vimal stopping by and reading. Tracking expenses, has really helped me to know exactly where my money is going, and this is made possible by using a tracking app. Planning your finances helps us achieve our goals both in short term and long term basis. Your post provides the necessary tips on how to go about this in the best way possible. Thanks for sharing. Thanks John for detailed comment. Tracking expenses really helps in saving some money. One of my short term goals is to reduce our family’s spending on groceries/food. We’re still spending well under the average 4 person’s monthly spending of $980 on groceries, but we have lots of room to improve by being more savvy! Oh yes That is a great goal to set and accomplish this coming year.Go for it and save some money. One of my favorite on the list is “making a budget” it involved almost a lot of factors in the list. Making budget would let you think about Paying debt, paying bills etc. 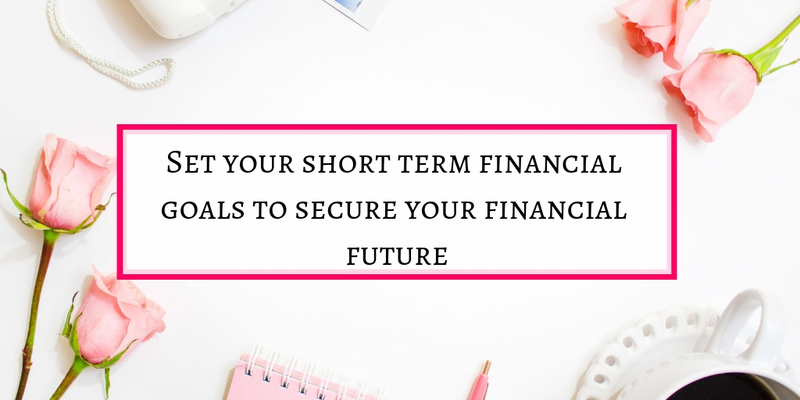 putting on your Short term financial goals are very essential for one’s achievement. Oh yes, making a budget is the base of everything financial. Thanks.